Beachgoers in a northern suburb of San Diego received a surprise visit by a US Marine helicopter, which made an emergency landing on Wednesday morning. According to local media, a CH-53 Super Stallion helicopter landed at Solana Beach, about 24 miles north of downtown San Diego. The emergency landing was reportedly due to a fuel leak. Eyewitnesses told local media that the CH-53 landed at around 11:40 local time on the Del Mar Shores beach south of Fletcher Cove. Marines and civilian hazardous materials disposal teams were on the scene, cleaning up the area. California’s second-largest city, San Diego is home to a number of military installations, notably the Camp Pendleton Marine training grounds and the US Navy base at Coronado. MCAS Miramar is the former home of the Navy’s “Top Gun” program, which was relocated to Nevada in 1996. 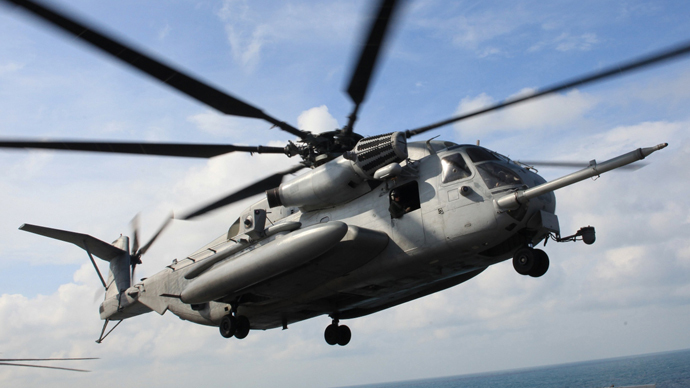 In service since 1981, the Sikorsky CH-53E Super Stallion requires 44 hours of maintenance per one hour of flying, and each flight hour costs about $20,000.